This visible-light image of LDN 483, a dark nebula, shows dark regions packed full of gas and dust as seen by the European Southern Observatory's La Silla Observatory. The dark nebula blocks the light from hundreds of stars, scientists say. A "dark nebula" of thick space dust blots out the light from a teeming star nursery in a striking new imag from an observatory in Chile. The new view of the Lynds Dark Nebula 483, or LDN 483, shows off a region of starbirth that includes wide swaths that are obscured in visible light. It was obtained using the MPG/ESO 2.2-metre telescope at La Silla Observatory, which is overseen by the European Southern Observatory. "Astronomers studying star formation in LDN 483 have discovered some of the youngest observable kinds of baby stars buried in LDN 483's shrouded interior," ESO officials wrote in a statement. "These gestating stars can be thought of as still being in the womb, having not yet been born as complete, albeit immature, stars." LDN 483 is located about 700 light-years from Earth in the constellation Serpens, the Serpent. As a star evolves, the force of gravity slowly contracts a ball of dust and gas that is pulled from the surroundings. The stellar youngster isn't producing much heat yet — its temperature is only at about minus 418 degrees Fahrenheit (minus 250 degrees Celsius). Eventually, as the baby star's core contracts, pressure and temperature will increase and fusion will ignite. But before it reaches that point, the protostar will spend a blink of astronomical time — about a few thousand years — in the earliest stage, and then a few more million years getting warmer, denser and putting out increased-energy light emissions. As time goes on, it will shine in visible light rather than just in infrared. A wide view of the LDN 483, a dark nebula of gas and dust 700 light-years from Earth in the constellation Serpens. 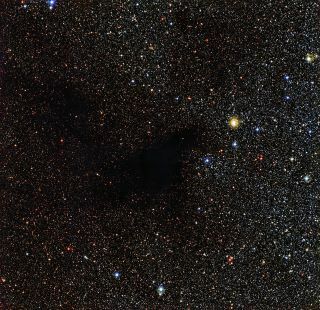 "As more and more stars emerge from the inky depths of LDN 483, the dark nebula will disperse further and lose its opacity," ESO officials wrote. "The missing background stars that are currently hidden will then come into view — but only after the passage of millions of years, and they will be outshone by the bright young-born stars in the cloud." The term Lynds Dark Nebula is rooted in the American astronomer Beverly Turner Lynds, who compiled and published a survey of dark nebulas— the Lynds Dark Nebula catalogue — in 1960. At that time, Lynds discovered dark nebulas through the painstaking visual inspection of photographic plates of observations made by the Palomar Sky Survey.